Reeling of head is a distressing condition.In medical terminology it is called Vertigo.Here there is sensation of reeling of head or the surrounding.There are so many causes for it.It may be physiological or pathological. Mainly three systems are involved in it.The ear and related nervous system,the eyes and related nervous system or the peripheral sensory system. The Course Of Vertebral Artery. Physiologically this is seen while suddenly getting up from a sitting or standing position called a positional vertigo.Amongst the pathological conditions atherosclerotic hypertension is most common .Other diseases of the three system described above can give rise to vertigo.Common causes are an infection or disease of the middle ear,visual disturbances like ill fitting glasses , sensory disturbance of lower limbs and more generalized diseases like diabetes are important. Atherosclerosis causes impairment of blood flow to the brain and it's subsections causing vertigo.Any body presenting with vertigo should be examined for atherosclerosis first.Hypertension easy to diagnose should be treated.Investigations like blood lipid profile is contributory. Ill fitting glasses easily be corrected and an ear disease is easy to diagnose and treat. 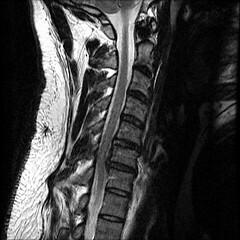 important.Here the vertebrae are deformed ,loose the flexibility and loose the natural C curve.The deformity may pose an obstruction to the blood flow in the vertebral arteries which travels through the bony processes of of neck bones.The vertebral arteries in tern could not deliver required amount of blood to the brain system and cause relative ischaemia and the consequent symptom of vertigo.This disease can also be diagnosed easily from a host of available investigations i.e. from a good quality digital X-Rays to MRI . Adequately treated spondylosis can go a long way in relieving the symptoms. But before jumping to diagnosis of Cervical Spondylosis as cause of vertigo the more common and dangerous cause atherosclerotic hypertension should be excluded. Thanks for the post!The post is very much informative.Flex Protex is very essential for improving our joint health. It is quite common now a days to have problems with our joint health. Flex Protex is the natural way to get rid of the pain without experiencing any side effects. The pain is very hard to bear and the painkillers stop reacting to the body after so much use.I wonder what should be the remedy.But I have been better with Yoga and exercise.When there is also a case of vertigo with the process it is worse. Very nice to know all these information.